Updated Maestro rear suspension features a trunnion mount shock with a longer stroke and smoother feel. With 160mm of travel, it has the new Advanced Forged Composite upper rocker arm for increased stiffness and strength plus lower overall frame weight. The lightweight and stiff Advanced-grade composite frameset features updated enduro-style geometry, so you can ride aggressive descents and rail corners with confidence. Reign's reengineered ALUXX SL aluminum frameset is optimized for its 27.5 wheels, giving you more control on the most aggressive terrain. Its Maestro suspension system offers 160mm of smooth, active travel. The rear suspension is updated with a new trunnion mount shock for improved small-bump compliance and pedaling efficiency, plus an Advanced Forged Composite upper rocker arm that's lighter and stronger than the previous version. Here are the core technologies that help Reign give you a competitive edge over rough terrain. 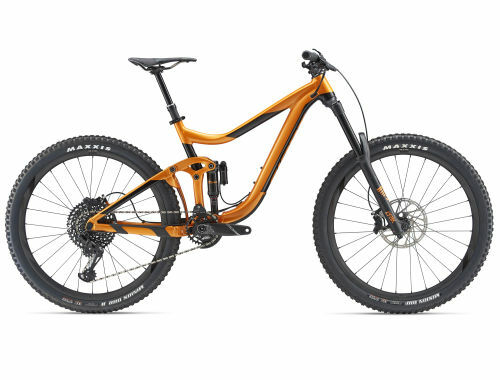 Updated “long and low” enduro frame geometry with 65/73 headtube/seattube angles for aggressive enduro handling, is tailored for 27.5-inch wheels to optimize handling and stability.